The Complex Silence Series is proud to welcome and share a contribution by Shane Morris to mark the twentieth release of the Series. Shane is well-known in the ambient universe for sharing his magnificent sound worlds freely as Creative Commons releases and through live concerts. Here, Shane presents four minimal pieces that can only be described as lush and gorgeous. Bell-like sounds and electric piano predominate, but to say that is at once a contradiction. Listen deeply and then listen even more deeply. 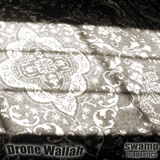 You’ll hear reversed drones, floating tones, washes of faraway sounds, hints of melodies, echoes and reverbs adding space and immensity to an overall ambience and drifting quality, yet each track is intense and focused. Four tracks of pure, ambient complexity. An October treat for your ears and for your mind. The Tribe Of Astronauts, a sublime anonymous musical collective, here hosted by Thomas of mystified, have for some time had their attentions focused on musician Fosel, especially admiring his dark ambient soundscapes. The Tribe decided to undertake a remix of Fosel’s classic “Gold Apples Of Cronus” release, available at Bandcamp: fosel.bandcamp.com/album/gold-apples-of-cronus . The two pieces have been combined into one metallic drone essay, about 20 minutes long. No sounds were used other than sounds extracted from Fosel’s original release. Enjoy! According to Ancient Egyptian myth, every night the God Ra journeys through the underworld, where he fights an important battle. He must win this battle and complete his journey for the sun to rise the next morning in Egypt. The anonymous collective The Tribe Of Astronauts, long fascinated with Ancient Egypt, have assembled an EP-length ambient piece sonically exploring Ra’s journey. Now in 24-bit quality, available free at archive.org. Mystified’s netrelease “Nocturne” now has over 8000 downloads. As of October 2011, it has been remastered and is available in mp3 or 24-bit FLAC. A free music video is also available for download. See why so many people have enjoyed this release! Swamp Magnetics is the product of a single improvisation session on Electric Guitar with an EBow and some effects hardware. The resulting sound was further subjected to digital processing to make it sing, drone and rumble. 13 vintage mystified tracks, remastered from the ground up from 32-bit audio, then downsampled. Includes 2 tracks from Brian Eno and David Byrne’s “My Life In The Bush Of Ghosts” remix project. Enjoy! Special thanks to Brian Eno, David Byrne, Cystem, Plexus Instruments and Cory Thrall for their cc-licensed samples.